Awww, man! More disappointing Christmas stories. 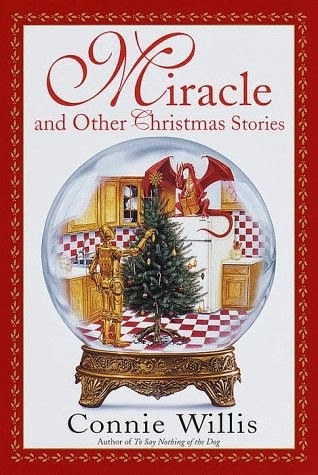 I went into this one with high hopes, because Willis’ story “Pony” was one of my favorites in Christmas on Ganymede. Unfortunately, it was one of my favorites here, too. It starts strong, with an introduction that was worth borrowing the book from the library for, just for the snark about Hans Christian *overrated hack* Andersen and the list of other recommended stories and movies, some of which weren’t on our radar yet! Sure, she thinks The/A Christmas Story is actually quality, and that's just wrong, whether you’re talking about the myth as literature or the movie as cinema (she likes both). But Willis is a Hugo winner! Surely, there are some good genre stories in here, right? Lets run through the contents, shall we? Starts strong, woman receives visit from accidentally conjured hippy Spirit of Christmas Presents, makes a cogent compelling argument for why “It’s a Wonderful Life” is a terrible movie. All good right? Unfortunately, about halfway through you see the “twist” and it devolves into another bad holiday rom-com. Sigh. Now, credit where credit is due: In this story, Willis probably comes closer than anyone else in my entire life in getting me to give a good goddamn about a baby in a manger. It’s a good solid story about a woman in a church choir with an unexpected visitor. Has a nice creepy vibe in some of it, overall too obvious. Read before. I still like it, although it doesn’t have much of an ending. Okay story about a bookseller meeting characters from A Christmas Carol fallen on hard times. This one confounded me at first. It is clearly presented as the latest in a line of Holmes/Poirot/etc. style stories, although the characters are aware of this. I just wasn’t sure whether these characters did in fact predate this story, and if it would make more sense if I knew more. Turns out no, and no. Still, it’s kind of a neat little murder mystery, if the ending is a bit clunky and I found the style grating. BEST story in the book. Really fun first-person tale about a possible alien invasion at the holidays. Everyone is nice, you see… too nice. This story about a preacher with a sudden urge to drive into a snowstorm starts strong, but goes on a smidge long. Then the end, which is supposed to leave a sense of mystery and be open to interpretation, just undermined the whole thing for me, leaving me unsatisfied. Short stories often have the problem of just being vignettes, but most of these were long enough ‘short’ stories that I thought the plots should have some closure, and only half of them did, it seems. It’s not a terrible collection, overall, but I was so annoyed by the first one that it took me a while to give the other stories a chance. 3 Stars - A Good Book on average.